Mother Nature has been on our side this summer…providing many sunny days and warm evenings. As a result of this superb weather, we undoubtedly want to spend as much time outdoors as possible so as to soak up the summer atmosphere! Why not do so in luxury? Over the past few years, there has been an increase in demand for aesthetically pleasing and functional modern outdoor furniture. 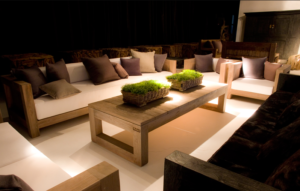 A trend has emerged to balance design with comfort in outdoor furniture. Modern outdoor furniture can massively improve the appearance of any house, which will not only provide a fantastic outdoor experience, but it will give your garden an instant impact, to you and all your family and friends!